With grant support from the UNL Arts and Humanities Research Enhancement Program, Michael Burton, assistant professor of practice in the Department of Textiles, Merchandising and Fashion Design, and William Thomas, professor in the UNL Department of History, are getting underway with a unique digital media production titled “No Ordinary People.” The short format animation will feature “Anna,” an enslaved women who in November of 1815 threw herself out of a third floor window in Washington, D.C., rather than be sold south and taken away from her husband and family. Upon completion, “No Ordinary People” will be released to film festival competitions, public screenings, and on www.earlywashingtondc.org. Rider, “But I did not want to go…” from Torrey, A Portrait of Domestic Slavery (43) Stanford Special Collections. Two hundred years later this work will visualize what pamphlets and a single lithograph were able to spark; a sensation in the anti-slave trade circles of the time and a Congressional investigation into the interstate slave trade and the kidnapping of free blacks. More importantly, says Burton, this interpretive work will recover the visibility of her story from history. Burton will be hosting a “spark talk” at 3:30 p.m., Feb. 19 in The Hub at Henzlik Hall to identify key writing and production help both within and outside of UNL. Over the next year his team will produce the animation. Once cut into short format, the animation will be entered into short film competitions as a viability study to determine competitiveness at the national level in outlets such as South by Southwest and Tribeca film festivals. Burton will be serving as principal investigator, co-producer, and lead animator. His work combines painting and animation to create visceral scenes that tell the stories of people with extraordinary pasts. He most recently completed animations for a PBS documentary about a Sioux family whose patriarchs fought in WWI and Vietnam, toured with Buffalo Bill, and survived the Fort Robinson Massacre of 1879. Burton's work has been included in exhibitions of new media at the Denver Art Museum, RISD Art Museum, Joslyn Art Museum and the Sheldon Art Museum. 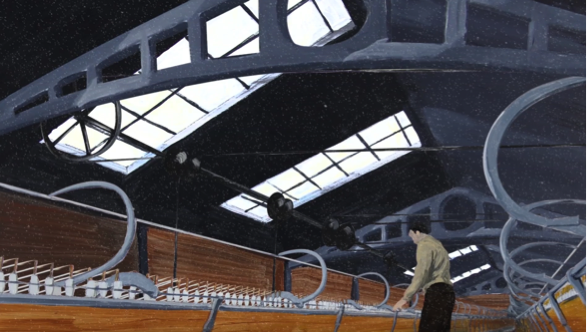 Michael Burton, “No Ordinary People: the Cotton Mills.” Still frame from animated painting. Thomas will be co-producer on the project. While conducting research in 2015 for earlywashingtondc.org, a project documenting all petitions for freedom in the D.C. courts and the family and social networks of early Washington, D.C., Thomas identified the protagonist Anna and uncovered the remarkable story of her petition for freedom 17 years after her attempted suicide. Thomas is the John and Catherine Angle Professor in the Humanities and professor of history in the College of Arts and Sciences. He currently serves as the Chair of the Department of History. He is a faculty fellow of the Center for Digital Research in the Humanities. He has produced award-winning digital history projects, and his research has been funded by the National Endowment for the Humanities and the American Council of Learned Societies. He is currently writing a history of early Washington, D.C. and the problem of slavery and freedom in post-Revolutionary America. For more information on the project or the spark talk, email Burton.